That's right, an official Firefly game is in the works and on its way to mobile platforms. This isn't a fan-made project, but the real deal officially licensed fro Fox. There isn't a lot of information on the game just yet, only the very large release window of 2014. Although, looking through the press release on the game, there is a slight red flag in that it doesn't mention the inclusion or even participation of Joss Whedon or the original cast of the show. 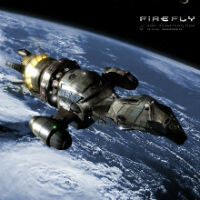 Firefly Online is in development right now, and will be a multi-user, social online role-playing game that will be made for smartphones and tablets running Android and iOS. Players will play as a ship captain as they hire a crew and lead missions, while trading with and competing against other players like themselves, and basically try to just "keep flying". Players will also be able to create their own ships, which is a nice touch. The developer QMX Interactive says the game will feature a "cross-platform player experience" so you will be able to continue your game on any device, regardless of the operating system. There is already a website up and running where you can register for updates on the game. So wait, after the complete f.tards at Fox cancelled Firefly then it became a cult classic, Fox is now off making money off it? Yeah well f. them!!! Yep, sounds like something Fox would do. I never watched Firefly but am a Joss Whedon fan so I can imagine it was a good show. What the hell? You go and watch it right now!!! Gotta get me some mudder's milk!